Solve the murder. Release the ghost! As a member of the Fayetteville Paranormal Crime Unit, you solved the infamous murder of Mr. Pennylock. Now, however, you’ve been called to return to his foreboding manor to investigate reports that Pennylock’s ghost has been haunting the manor, fueled by anger over the theft of his wife’s prized necklace! You only have an hour to find the necklace and set his soul to rest, otherwise, it will be trapped inside the manor forever! From my conversations with enthusiasts from the area, and from speaking with the owner and employees of Xscape Factor, not only is this room “haunted,” but the historical building the business resides in holds a bit of spectral history as well. According to them, they’ve had some strange occurrences pop up here and there, ranging from strange sounds to Game Masters being locked in the rooms at night when trying to reset rooms after the final customers have left. It all helped to set the stage for a spooky escape experience! The room itself was very well set up, with an excellent set design that included dim, flickering lighting, creepy Victorian photos on the wall, and antique looking furniture all around. Unfortunately, 30 seconds into our game, we ran into a freak accident where all the power surged for the whole building, leading us to find the necklace before we were supposed to, spoiling the hiding place for the ending. This, however, was taken care of quickly by the staff, who apologized profusely, then ushered us out and reset the room asap so that we could start again. Game flow worked excellently, and solving the mystery of who stole the necklace was a great meta-puzzle to work towards, and the non-linear nature of most of the room kept the four of us puzzling throughout. We required no clues, which is a testament to the room’s fair design. (Trust me, we usually need clues somewhere!) This isn’t to say the room is easy by any means, it was definitely a challenge, and we had to work through a lot of great conundrums to secure our victory! The dreaded lockout safe makes a unwelcome return after being absent from our games for a blessedly long time. Per usual, we were so covetous of our 3 precious entries that we didn’t want to put in a certain code we’d found, and we were told we could only confirm a code with the GM one time, so our skittishness cost us a few precious minutes. Really, if a lockout safe is deemed necessary, (and they never are,) checks through the GM should be unlimited for this universal design flaw. There were a lot of laminated papers about, and though it wasn’t the worst thing, it did remove some of the immersion. A late game piece of tech was also pretty finicky, requiring quite a bit more specificity to it’s code than is usual for this type of puzzle. There was also one puzzle that identified a bit of information which required locating and reading a very particular article, which seemed to be overkill, and required an answer that was a fair leap of logic. The spooky mystery of Haunted is a great mashup of the murder mystery and supernatural themes, with a exciting mix of classic and technological locks to keep players on their toes! Working through Pennylock’s office was a great adventure, requiring teamwork and communication, and I highly recommend giving it a shot, as it was definitely my favorite room at Xscape Factor. You can book your paranormal investigation here! Full Disclosure: Xscape Factor provided Media Discounted tickets for our team. Sasha Millington, daughter of real estate magnate, Warren Bankhead, was kidnapped during a gala celebrating the opening of the Sioux exhibit at the Valley Falls Museum. A ransom note has been received asking for ten million dollars in exchange for her return. Time is running out. Discover the kidnapper’s true identity and motive for abducting her before it is too late. It seems like almost every time a new Deadbolt Mystery arrives, it has even more puzzles and quality props! From the humble beginnings of the still great Murder in 3B, Hostage exemplifies the evolution of The Deadbolt Mystery Society. Sleek paper props, along with some great tactile items continue to make Deadbolt one of the most visually striking boxes we currently subscribe to! There is a fair amount of code breaking to be enjoyed with Ransom, per Deadbolt’s usual MO, and it’s well integrated into the mystery, but there are a few other logical puzzles to solve and many deductions to make, allowing for a varied experience. Suspect interviews tie excellently into each other and provide a sense of intrigue to the story, slowly bringing together the building blocks of the narrative! While a kidnapping and ransom could be a very dark theme, Deadbolt doesn’t let it get too uncomfortable, keeping the tone mysterious rather than ominous. The side stories crafted help further the investigation in an interesting way, and lead to pertinent revelations about the relationships of the many people surrounding Sasha Millington. The epilogue ties up all the loose ends of the box in a satisfying denouement, explaining motives and backstories in a excellently detailed manner. Wouldn’t you like to know where Sasha is? One interaction breaks immersion by being a strangely ambiguous counting and math puzzle that really doesn’t fit into the story in any way. One main deduction that tied together the story neatly was hidden in a place that, from the past five boxes, we’d felt we were trained to generally ignore, and one of the revelations of the identity of that person wasn’t explained until the epilogue was being read. This led to a fair bit of confusion at the end of an otherwise exciting mystery. The suspect pool for this mystery is nowhere near as exciting as those from past boxes, especially Asylum and Sleight of Hand, so the climax wasn’t quite the revelation we were hoping for, but the game itself was still a tightly crafted experience. The collector’s cards are always nice touch, but this month’s felt as though it could be a very small spoiler for those that care about such things. I don’t, but I know others have a high aversion to anything that could be even the slightest bit spoilery. Ransom is another solid entry in the case files of The Deadbolt Mystery Society! It’s definitely an excellent jumping in point for those looking to test the waters with a recently archived box, and really shows off how far the Society has come in just a few short months! Join the Deadbolt Mystery Society here! Right now, you can get 30% off your first box with the Promo Code ESCAPE30! You can also see the rest of our Deadbolt Mystery Society reviews here! Why’re they taking the cows? Area 51, the mysterious Air Force base in Roswell, New Mexico, has been the epicenter of much speculation about aliens and mysterious sci fi technology for decades. You and your friends have found a way into the facility, but something seems off; it was just too easy to get inside! You’ve made your way to an abandoned looking office as soon as the facility goes on lockdown, and you’ll need to figure out what’s going on, and possibly save the world, before it’s too late! We’d had a good time at Escape Artist, especially with their Yin and Yang experience, and to a lesser degree, their Hangover room, and we were ready to see what would happen when we broke into their version of Area 51! Upon entering, we saw that in the dark, there was a glowy alien hooked up to an IV, and no Men in Black around, so we got to searching the office for clues! I need 50 ccs of green goopy stuff, stat! Area 51 was described to us by our game master as Escape Artist’s most difficult room, and while we didn’t find it overly difficult, it did provide a good challenge for our group of four enthusiasts. A mixture of logic, math, dexterity, and spatial reasoning puzzles kept us all entertained throughout this mostly non-linear adventure. This mix allowed each teammate to shine, and when one of us was stumped, the next could pick up the puzzling thread and run with it. The game flow worked well, and with the exception of a small search failure on our part, each puzzle led into the next seamlessly. Hints provided within the game were vague enough to challenge us, but not so obscure as to become a game of “guess what the designer was thinking.” Props around the room were fun to play around with, and added to the somewhat spooky sci fi theme. Probably the lowest point to Area 51 is the ending. Unfortunately it is highly anticlimactic, and doesn’t lead to an exciting escape or huge revelation, as it mostly feels more appropriate as the end of a paper based puzzle hunt than an escape room. It is also incongruous with the entire reason you’re trying to figure out the puzzle itself, as it makes it seem as if the stakes are really high, and then completely falls flat onto a non sequitur. There are also a couple points at which props feel worn and overused, ready for replacement. The room itself is only of average set design, and really doesn’t feel like it would be on the inside of the mythical Area 51. The experience is very much based in early days escape room design, never quite cracking into new territory, so as enthusiasts, nothing blew us away. Finally, there are several groupings of locks that accept the same type of codes, requiring guess and check around the room until you find which one ties to the codes you find. Area 51 is a classic escape room, and while it doesn’t exactly shine as brightly as Yin and Yang, it’s still a decently fun experience that reminds me of the online puzzle rooms of the 2000’s. As long as you’re not expecting a deep story or anything too technical, there’s an enjoyable run of puzzles to be found here. Beginners will definitely get more out of the experience, but enthusiasts looking for a more nostalgic adventure will have a good time as well, though it won’t blow your mind. You can book your time in Area 51 here! Full Disclosure: Escape Artist provided discounted tickets for our team. A team of researchers and explorers went dark within the most shadowy corners of the Amazon. You’ve been sent in to find and extract them, but unfortunately, every night, the scanners go haywire, making it that much more difficult to identify where they are. You’ve found a distress signal late in the day, and as you approach the area, your helicopter suddenly loses power and crashes! It’s up to you to figure out what’s going on before nightfall and get out of there before the mysterious anomaly occurs again! MacGregor Manor is hands down one of the best escape rooms in the RDU area, and when we saw that Trapped in a Jungle was going live soon, we had to come back to Game On for more excellent escapes! The centerpiece of the Jungle itself is not only amazing to look at, but is a great hub for a series of well thought out and engaging puzzles! In fact, set design is very well done, and include a wonderful lighting effect to keep a general track of the time before sundown. Though the puzzles themselves seem esoteric at first glance, once you have collected everything you need to solve each interaction, the solutions become clearer and clearer, while still remaining challenging. One of the best parts of this room is that for many of the puzzles, you’ll find props and décor that seems out of place, and as you solve, those items will reveal their relevance in an extremely satisfying ah-ha moment! Even props that seem like mere decorations can surprise you here, and almost everything we touched ended up being important due to the tight puzzle design and excellently directed game flow. The shift from the early to late game puzzles is thematic, and the beginning of the second half of the game is appropriately mysterious and caught all of us off guard. The later game is more mechanical, and meshes with the new environs in a fantastic way. Care was obviously taken to ensure each step of this adventure related to the theme of the room, and furthered the story. The climax of the game is excellent, and allows you to make a choice I haven’t seen before in an escape room, so kudos to the designers for adding in that excellent interaction! The only puzzles we needed hints on could’ve used a smidge more direction, though it could be that our team is generally terrible at this type of interaction. One of them, is being iterated per the designer, so it shouldn’t be a problem by the time of this writing. There was an unintentional red herring we came across that took us some time to resolve as meaningless, which we also discussed, and steps are being taken to remove the effect this particular item causes. One puzzle made total sense to us, but could use a slight bit of feedback in order to ensure teams know they’re on the right track. 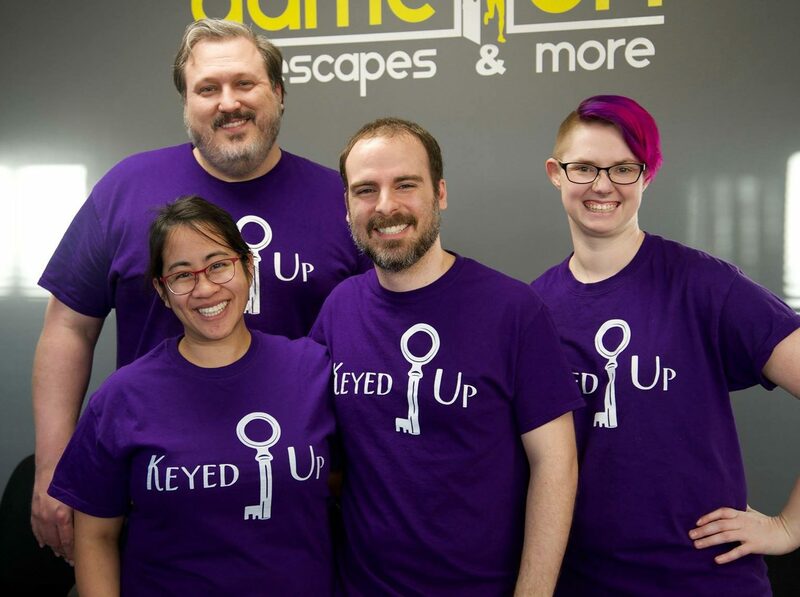 Trapped in the Jungle is another excellent addition to the Raleigh Durham area escape scene, and I am excited to see what comes next for Game On! The obvious care and attention to detail allows their rooms to shine, and this one is no exception. You should absolutely give them a shot when you’re in Cary, and you can book your time escaping the Amazon here! Full Disclosure: Game on Escapes & More provided media discounted tickets for our team. The Dayton Art Museum has recently been hit by a notorious art thief! An alert security guard noticed someone fishy skulking about, and gave chase, but unfortunately, the culprit was able to get away! One of their most valuable pieces, “Midnight Secrets,” was taken, but according to surveillance cameras, the painting may still be inside the museum. In fact, someone on staff must be behind the crime, as no alarms were tripped and all exits were covered by a top of the line security system. It’s up to you and Sullivan to piece together the clues to figure out who is working with the Midnight Thief and track down the painting before it disappears for good! Of all the offices in all the world, she had to walk into mine. I’m always excited when it comes time for another Sleuth Kings mystery, and this month was no different! Once the box arrives, I always wait for my fiancé to be ready to start the adventure, but before putting the case away until then, I noticed was that Sleuth Kings has another super snazzy box! (Pictured above.) The artwork for this one is pretty amazing, and provides a glimpse into Sullivan King’s appropriately Noir world. This small change was enough to make me want to open Case 011 up early, but I was good and waited. Immerse yourself into the mysteries of art! Sleuth Kings is always great at coming up with new and exciting themes from month to month, and the art heist Sullivan is investigating this month is a fantastic idea! The puzzles include excellently themed props, and provide a mixture of tactile and logic based puzzles for a varied and well crafted adventure. One of the strongest points of Sleuth Kings is the side stories that are told between the lines of the puzzle threads, and Midnight Secrets continues this fun tradition, while twisting it slightly to provide some extra breadcrumbs along the way. This easter egg provided a fun little side theory while I was solving, and expanded the experience without being a major or required element. The story itself is tightly woven, and kept us immersed from start to finish, managing to keep the stakes high while delivering on a lighter theme! Conversations with Sullivan continue to become more exciting every case, and the details of some of the climactic events were a blast to read. This case also sets up a few hanging threads, prepping for a sequel much like Cases 007 and 008! I cannot wait to see how the story evolves from here. Finally, this was our 8th case solved, so we’re excitedly waiting for the next bonus case, tying into the disappearance of Sullivan’s father! Another satisfying conclusion, with the promise of another bonus case! The puzzle that stumped us was great, though we were stuck on it for quite a while and could not determine how we could figure out the method of solving, even with the two hints we got from Sullivan, which basically told us what we already knew. After those hints, the only other avenue was to allow Sullivan to reveal the answer, but fortunately, Sleuth Kings provided great customer service when we contacted them via their Facebook page, and they sent us an extra hint so we could overcome the speed bump we’d hit. A small bit of built in cluing, or hints that were for further along in the puzzle would’ve helped a lot. Midnight Secrets is a fantastic adventure that continues to deliver Sleuth King’s amazing brand of well plotted storylines and clever puzzling. I 100% recommend subscribing, and definitely think it’d be worth your while to pick this one up from the archives in preparation for Case 012! You can use the promo code ESCAPEADVENTURE to get $5 off your subscription here! You can also read the rest of our Sleuth Kings reviews here!